2018 is officially over and what a crazy, wild ride it was from start to finish. The year kicked off with a bang as my Buffalo Bills finally made it into the playoffs for the first time since 1999. I was so happy I cried tears of joy every single day leading up to the playoff game. Of course they lost that Sunday, but I wouldn't give up that fabulous week of bliss for the world. Mr. T and I finally got out to St. Louis to check out Side Project Brewery. This place was honestly one of the best breweries we've ever visited. The list was loaded with some of their rarest bottles, the staff were incredibly knowledgeable and the space was so clean and comfortable I just wanted to spend the entire weekend relaxing in the tap room. Of course we also made a few fun beer trips to Vermont, along with a new beercation to Miami for Wakefest and of course there was our amazing European vacation to Paris, Bordeaux and Brussels where we finally had a chance to visit In De Verzekering tegen de Grote Dorst. One of my favorite memories of the year was sitting outside that dusty old building, drinking lambic and eating a round of gueuze cheese in the crisp autumn air. Of course there are always low moments during the year and tears of true sadness came in June when Anthony Bourdain, one of the most inspirational people in the food world passed away. I found myself in front of his Les Halles memorial with hundreds of others too many times to count, mourning the lose of such an incredible man. 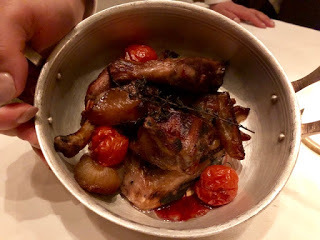 That's enough sad talk for today, onto the Best NYC Tastes of 2018! It's certainly not a cheap item but the Seagram Crab Cake is firmly my favorite dish of the past year; rich chunks of lump crab meat bound together by a crispy layer of flowering roasted potatoes and dressed with a creamy mustard aioli. 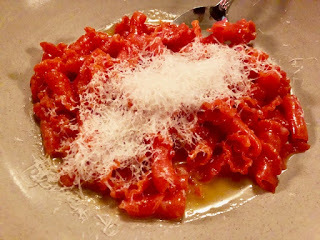 I love absolutely every pasta on the menu at Barano, but the Saffron Gigli are my absolute favorite. These toothsome orange noodles are dusted with pecorino cheese & black pepper, then doused in a Calabrian Honey Sauce making them sweet, spicy and incredibly addictive. 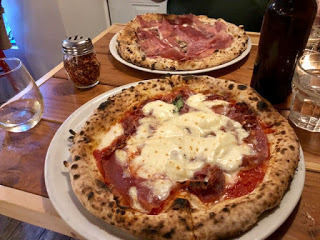 This tiny little spot in Harlem specializes in Neapolitan pizza that's a little thicker than the usual Neapolitan style, with a soft fluffy exterior studded with bubbles of char and the perfect combination of toppings like the Valdostana with tomato, prosciutto and crispy sage finished with melted mozzarella and fontina cheese. 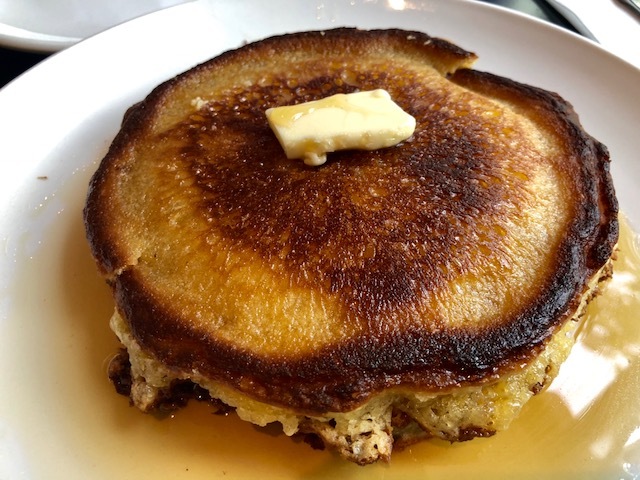 Pancakes have never really been something I seek out in restaurants. I see them mostly as a vessel for maple syrup and butter (two of my favorite condiments). But after one bite of the pancakes at Chez Ma Tante, my mind has been changed forever. These beauties had a spongy, fluffy interior and a crisp, almost brunt exterior that left the edges of each cake crunchy and caramelized. On top a heavy dose of pure Vermont Maple Syrup and a rich, creamy pat of Normandy butter. 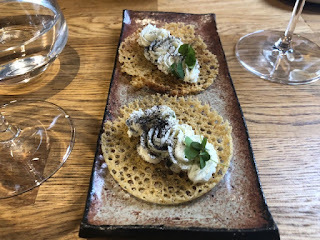 These pancakes were perfect; soft enough for soaking up all that wonderful syrup but crisp enough to give each bite a satisfying crunch. Every trip to the Hudson Valley this year meant a stop at the Olde York Farm Distillery. 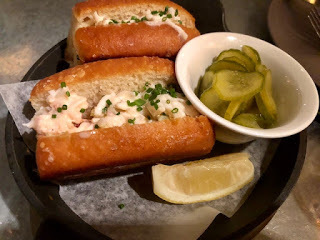 Their cozy, carriage house tasting room was the perfect place to meet up with friends and share some incredible cocktails. 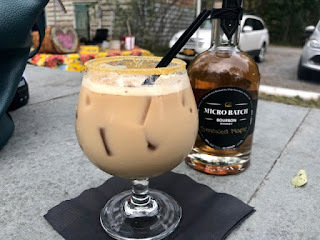 Favorites included the seasonal Black Walnut Eggnog made with Cacao Vodka, the Old Fashioned with Maple Bourbon and of course their Not So Basic, a frothy mix of pumpkin vodka, condensed milk and cold brew coffee. 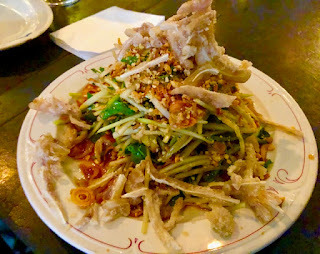 This East Village gem is best known for it's rich beef laden pho, but the crispy Pig Ear & Papaya Salad is the sleeper hit on the menu. It's bright and citrusy with a satisfying crunch from crushed peanut, finished with a sweet soy dressing. The Pork and Shitake Gyoza's from Kyu were so incredible, even the bonita flakes were dancing in excitement on top when they arrived. 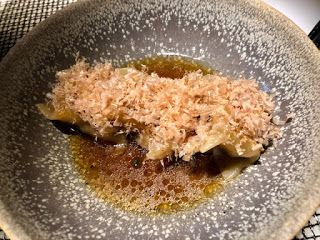 These lightly fried pockets of dough were crispy on the outside, tender on the inside and dressed in a ponzu truffle sauce that was so delicious, the entire world could have melted away and I wouldn't have noticed. Covina has been my go-to spot for just about every meal, then they started a new happy hour and I basically moved in. Each day from 3:00-6:00 PM Covina offers $8.00 beer, wine and cocktails at the bar including Tito's Vodka Tonic, Fernet & Coke and my favorite the classic Negroni, alongside their amazing food like the rich Wagyu Beef Burger, big, briny oysters and twin Lobster Rolls in warm Parker House rolls. 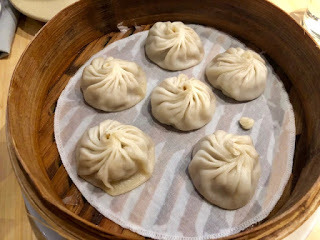 This narrow SOHO spot is churning out incredible soup dumplings that are small, almost bite sized, with a thin exterior of dough that somehow manages to stay perfectly intact. Inside a mix of pork and seafood soup that's rich and satisfying without the fatty shine of most soup dumplings. Our meal at this inventive little spot in the 9th Arrondissement was similar to being on the perfect first date. The dining room was gorgeous yet comfortable, the service charming and each course had a little something unique that instantly made me want to return and discover more. 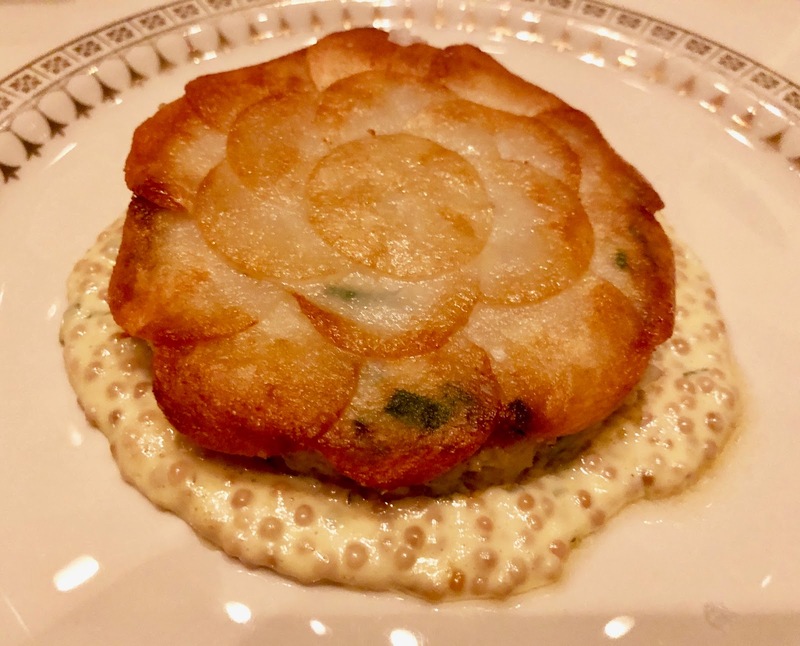 The best meal decision this year was easy; my choice for favorite dish of 2018 was the Seagram's Crab Cake and Mr. T's the Pasta a la Presse, so the Grill was the obvious winner. 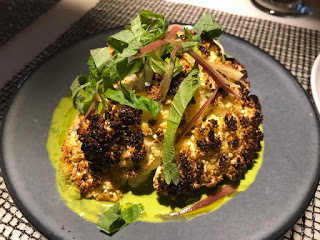 This restaurant was spectacular from beginning to end; the gorgeous ambiance, impeccable service and of course the incredible flaming Baked Alaska dessert made for a perfect night in NYC.